With the DBX's CT-3 Advanced Cable Tester, you can test up to 10 cable types with a maximum of 8 pins. The chassis can be split into two modules, a sender and a receiver, enabling convenient testing for longer and installed cables. Also, the CT-3 has a tone generator, a variable test speed control, and multiple LEDs that indicate pin continuity. Box Dimensions (LxWxH) 9.3 x 7.5 x 3.4"
CT-3 Advanced Cable Tester is rated 5.0 out of 5 by 4. Rated 5 out of 5 by Pete from Easy to use, high quality, and great price This is an outstanding unit in my opinion.? I do live sound.? Nice strong metal box and the unit comes apart into two pieces to test either very short cables like for a guitarist's pedal board or long cables.? I highly recommend this unit.? The battery leads are nice and long.? Easy to use. Rated 5 out of 5 by Mark from Great quality product A solid built, metal cable tester. I've only used it to test BNC and RJ45 so far, but it's been an incredible product. Helps me double check patching in venues where the wiring isn't always labeled properly. Very clear LED's while testing. Will definitely buy this one again. 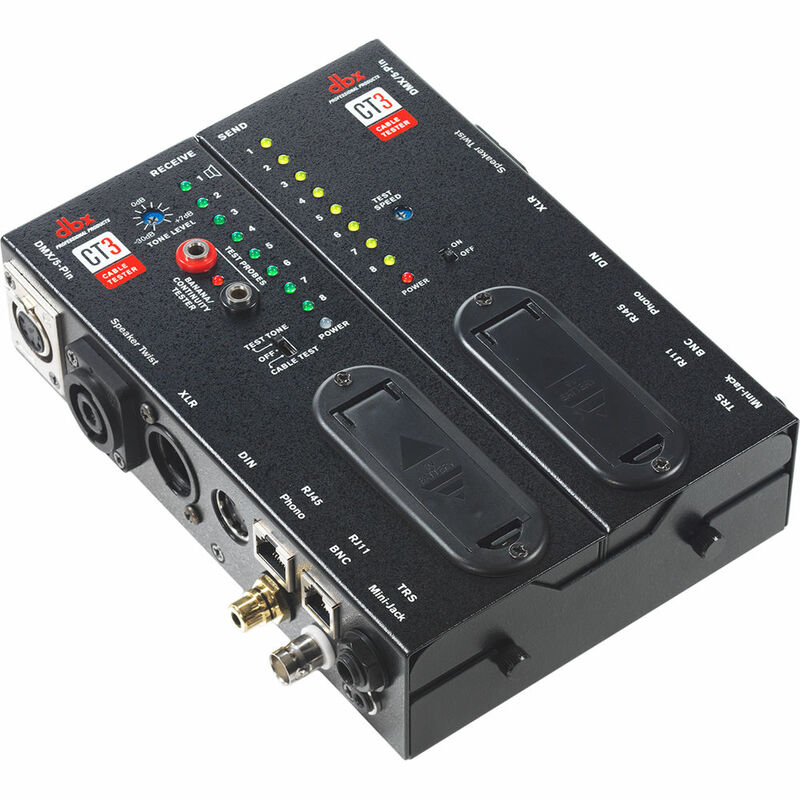 Rated 5 out of 5 by Peter from dbx CT-3 Advanced Cable Tester Great! Seems to be pretty durable too. However, I wish there were an option to test HDMI cables - then it would cover all the cables I am likely to encounter (with current technologies). Rated 5 out of 5 by JWCLD from DBX CT-3 has the options I need. Love this tester! Does dbx CT3 test shield of RJ45/CatX (STP, FTP, etc)?